After watching the debut of the Disneyland TV Show last night, I stayed up late and watched the "Kraft Theatre", then "This is Your Life" with Ralph Edwards. So today's post is a light one. 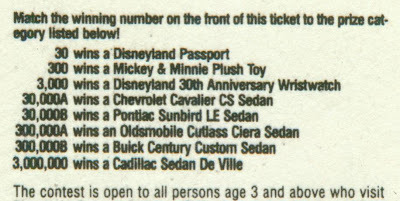 From the back of the ticket, here is the list of possible prizes. Notice this contest is open to persons age 3 and above, what's a 3 year old gonna do with an 85' Buick? For the Lawyers out there, here is the entire back of the ticket. *Notice the January 31, 1986 expiration date. If we split the prize, we might need a time machine to collect it. Check back here later for the prize results. Well there's a fine "how do ya do"! 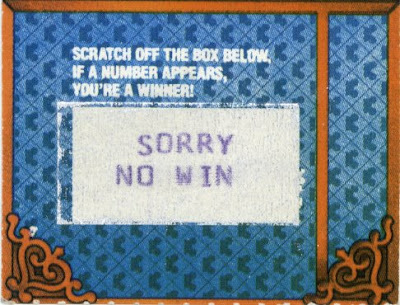 Oh well, at least we got to see that high tech band printer font telling us "Sorry No Win"... Maybe we'll have better luck next time, I have a few more tickets. "Why Disney changed his mind about TV". 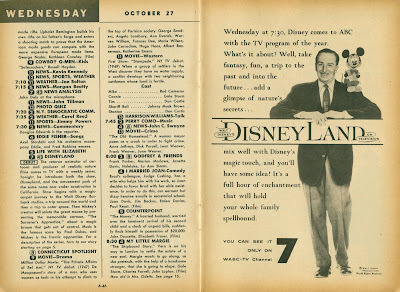 Here's a super TV guide from the week of October 23rd thru the 29th, 1954. October 27th would see the debut of the new TV show "Disneyland". I like how Goofy is combing Walt's hair! 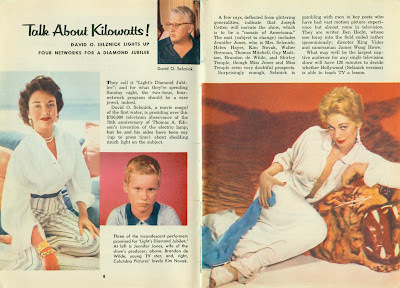 The Article is but three pages long, which seems average for TV Guides of this vintage. Lots of interesting things, the "Lands" are two separate words "Fantasy Land", "Frontier Land" and "Adventure Land" and the forth land is "The World of Tomorrow". 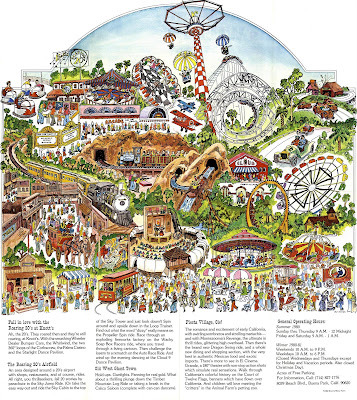 Repeatedly referred to as an "Amusement Park" this article correctly predicts a July 1955 opening date. The 9 million dollar prediction was way off! I have read Walt thru in his own money at the end (and money from ???) to make the final total over 17 Million! Here's the full page ad Disney placed for the debut of the Disneyland TV show at 7:30pm. Conveniently on the page next to the actual listing. Hmmm, Perry Como is on at 7:45, I'll give this "Disneyland" thing 15 minutes to impress me, otherwise it's Perry all the way! 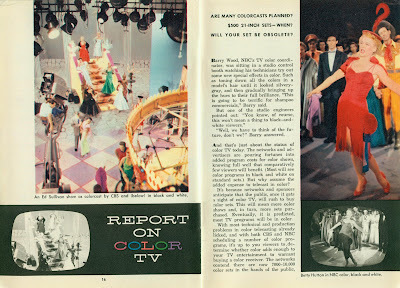 Color TV was in its infancy in late 1954. 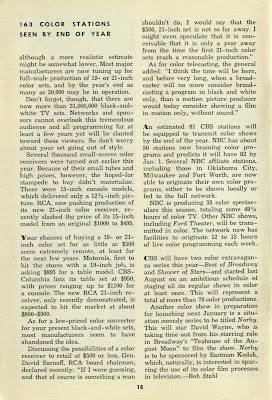 As this historic article states, there were 31 million TV sets the US in 1954, and 7,000 to 10,000 of them were color! And a good number of those were in stores unsold. 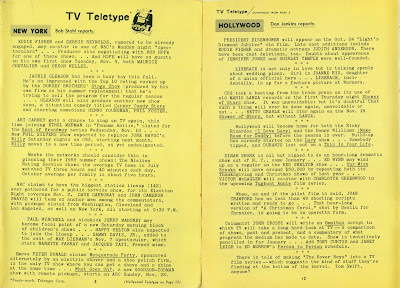 "Eventually it is predicted, most TV programs will be produced in Color". This issue of TV Guide has 5 programs in color, 5 for the whole week! I hope you enjoyed this little time travel journey to one of TV's Golden Years. A simple post today, light on facts because I don't have many. This "Angel Fun Pack" contains 9 tickets good at Angel's baseball games on dates from May 7th thru August 28th, 1967. These were for Magic Kingdom Club members and were not good for admission to the game itself. The cover of the "Angel Fun Pack". Its got a serial number, but the tickets don't. Globe paper trademark on the lower right and a whimsical odd looking castle on the left. For the record, The Angels won 5 to 0. Tomorrow: Week of October 23-29 1954. Anyone want to guess? 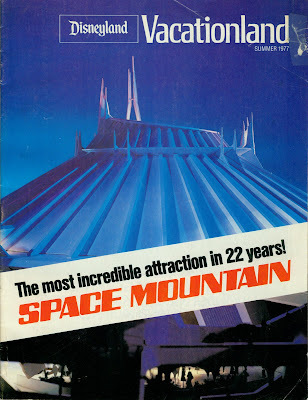 Space Mountain is 31 years old today, Happy Birthday! A great attraction that’s still very popular today. Try and get on Space Mountain after the evening parade, good luck, it seems everyone wants one last ride thru space. 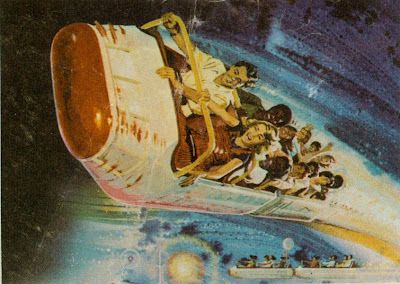 First up to help celebrate is a parking lot flyer daring you to “Race thru Space Mountain” on Disneyland's newest attraction. Are you ready for your "journey into the black void of infinite space"? 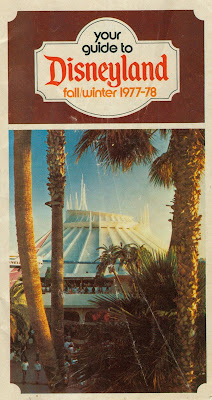 This is the cover of the flyer, the Space Mountain page is actually the back page. 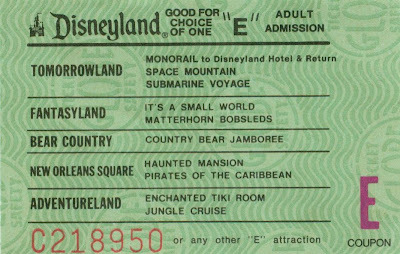 First “E” tickets with Space Mountain appearing on them, from June 1977. 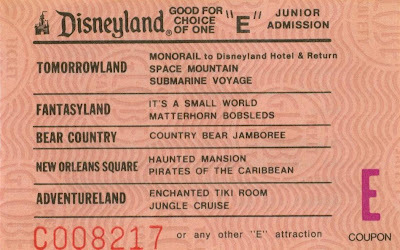 Within a year, the words "Roller Coaster Type Attraction" would be added next to "Space Mountain" on the tickets. 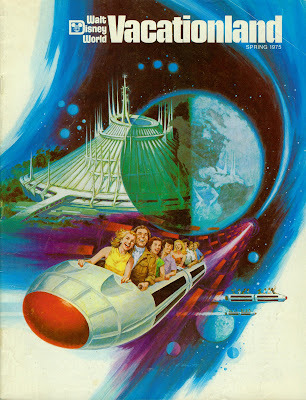 First Disneyland “Your Guide” book with Space Mountain on the cover. Check back Bonus Sunday for the entire guide. Neat little drawing on the inside cover. 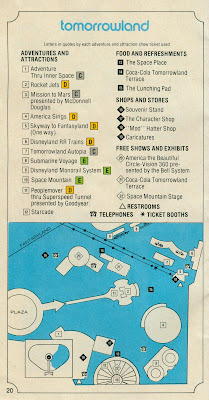 Tomorrowland page of the guide showing the ”new” Space Mountain. Great cover of the Summer 1977 Vacationland. 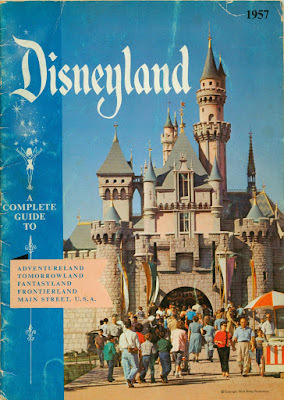 This edition includes great articles on; Space Mountain, The Rescuers, “Disneyland’s Own Wild West Chorus Line”, Orville Redenbacher’s Popcorn & more. Check back on Bonus Sunday for the entire issue. 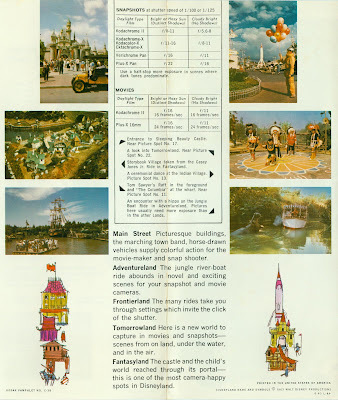 Lastly from Spring 1975, Walt Disney World’s Vacationland. Space Mountain of course was in Florida first. A somewhat different ride than Anaheim’s with single in-line seating and two separate tracks within the Mountain. Want to see the whole issue? Sure, I’ll have it on Bonus Sunday as well. From Monday's post (link) this is the Map on the reverse side of the "Southern California Freeway System and Points of Interest" brochure from 1980. 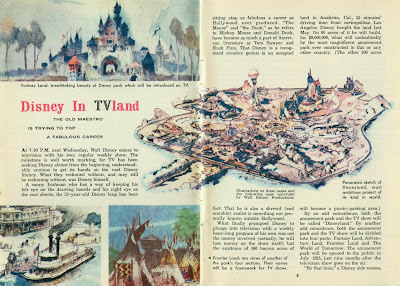 As promised in Tuesday's post "2 Exciting New Plans to Visit Disneyland in 1957" (link) here is the entire 1957 Disneyland Guide. Lots of great stuff in here. 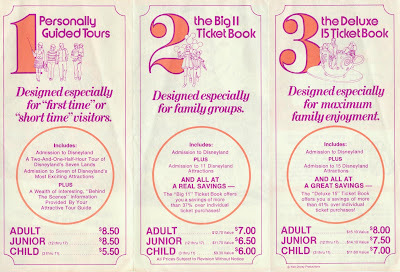 Wednesday was the 1973 Boys Life visit to Walt Disney World (link). 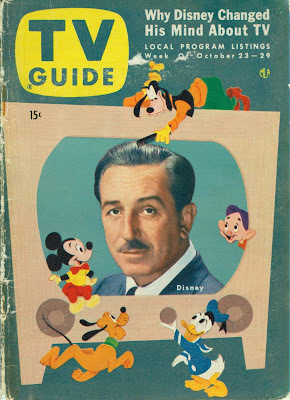 Here is the Entire Walt Disney World Guide from 1973. 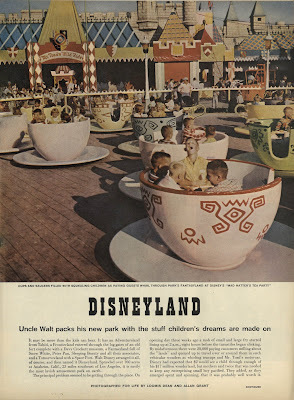 Thursdays post was a look way back to Disneyland in Life magazine August 15, 1955 (link). For my good friend Richard over at Viewliner Ltd., here is the cover featuring "The MacArthur Story". Also, here is the entire article. Here's an article from the May 2008 Edition of Westways, the AAA magazine. I do miss the "old" smell of the trains, but the new smell is kinda neat too, especially if you're hungry. Today's Mega Holiday Bonus Sunday post will have to last for two days, the blog will be closed for Memorial Day, have a great holiday, see you back on Tuesday. 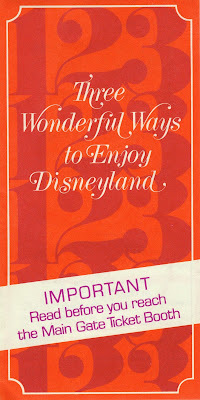 Last Saturday's post featured a 1956 Kodak Tour of Disneyland pamphlet (link). 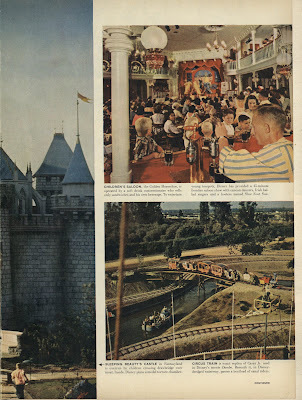 Today's Kodak Tour of Disneyland is from August 1963, "Kodak Pamphlet No. C-38"
The style of artwork sure did change from 1956. The size of the pamphlet changed too! It's about 8" by 10" and just a simple "tri-fold", no fancy foldout as in the 1956 version. The artwork on the map is "different". Monstro looks hungry! Neat Tomorrowland picture, far-out spaceman with fun balloons and .19¢ a yard fencing! While I feel most of the artwork on this pamphlet is just "ok", I really like the little designs on the back page. 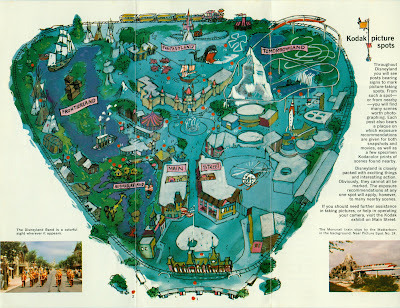 Tomorrow: Is Mega Holiday Weekend Bonus Sunday including, but not limited to; Complete Guides - Disneyland 1957, Disneyworld 1973; Big Stylized Knott's Map 1980, Green Disneyland? Today's post it an odd mix of new things, welcome to the way my mind works. A new "Your Guide to Disneyland", the last cover was the super Matterhorn shot, now this nice one! The art department is on a roll. 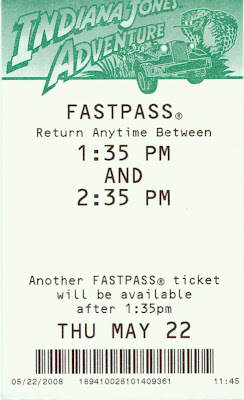 Indy FastPass. I didn't hang out to use it. By not using it did I take away someone else's chance at a fast pass or did I make the standby line move faster? "Sorry" or "Your welcome". Now to travel 1/2 way around the world and at Christmas time yet, how unrelated to Indy could this be? 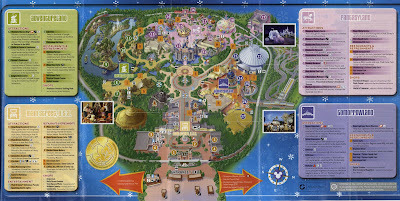 Disneyland Hong Kong, I think this is from last Christmas (correction, its from 1999), hey only $650 for an annual pass! This map was 19 inches long so even in the BIG scanner the legend has to be scanned separate. Rules and Regulations. Seems a little more of a tight ship than Anaheim, not really a bad thing necessarily. Tomorrow: Another Camera Tour of Disneyland, this time in 1963. 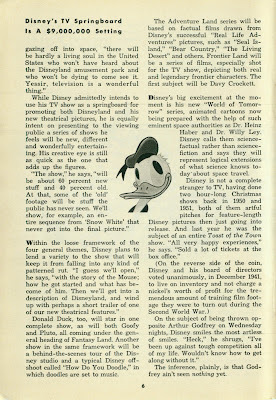 Staying with yesterday’s “Magazine” themed post, today let’s set the way back machine to August 15, 1955. 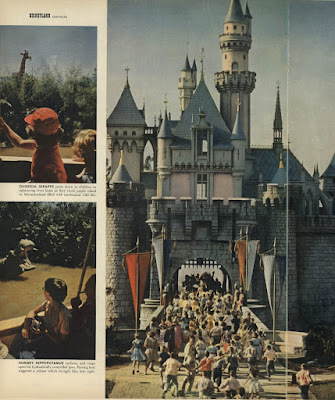 This is a four page article on Disneyland from Life Magazine. I didn’t scan the cover; it has no Disneyland references and has a not so flattering photo of General MacArthur. Interesting how only four pages were dedicated to this Disneyland article. MacArthur gets 25 pages and an article on a 1950’s house wife “The 80-hour work week” gets 10 pages! I guess Disneyland was still not a “sure thing” just a few weeks after its opening, therefore if only gets four pages. And it’s very “light” on the text. First up, the Tea Cups with no paint on the deck! That’s the “Mad Hatter’s Tea Party” to be more precise. Next some shots of from the river boat as they “Circle Jungle Island”? The Castle shot slides over to the other page so I tried to include the whole castle in this scan. Notice the castle windows, you can see straight thru them! I don’t think I have ever noticed that in any of the old photos. Obviously this went away when they created the “walk thru” which by the way, I hear rumors it may be coming back!!! Children’s Saloon? I suppose that’s because they don’t sell alcohol? Those Coke fountains sure look neat! Notice a few things on the Casey Jr. Ride; Nice landscaping for the Canal Boats! Is that a TV camera on a raised platform thing? If so, was this for the opening day broadcast? I thought Casey Jr. didn’t open for about a week after Disneyland opened so what’s up with the camera? 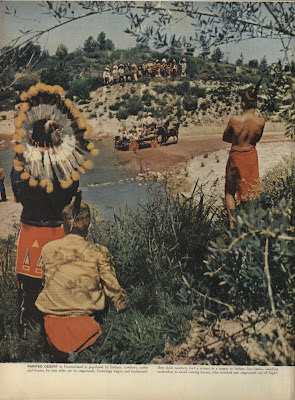 Lots O’ Indians in this picture, real ones! Interesting “Buckboard” ride, I don’t think I’ve seen that on any tickets! Not much to hold the guests in, better hold on tight. 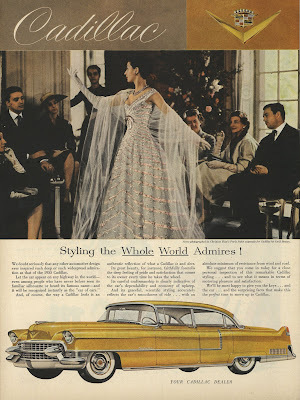 This Life magazine is FULL of great 1955 car ads. I am a vintage car nut, I used to buy and sell them like trading cards, I am much better now. But I sure love looking at these old ads. Since I am mostly a GM fan, the first three are beauties by GM. Then a Mercury, Nash and a Studebaker. I guess Chrysler was not up to spending the advertising dollars to be in Life Magazine. My first car was a 1956 Buick Super 4-door Riviera hardtop, very much like this 1955 Buick Century. 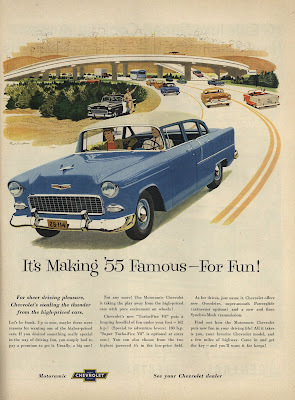 Even the ink pens were “car crazy” in 1955. Styled in Multimillion-dollar new car colors. I thru this large two page “Dan River” ad in just because I like it. I’m told the 1950’s really weren’t this fun; it’s just the way everyone wanted it to be. Maybe that wasn’t a bad thing; at least they “wanted” it to be idealistic. Today, I am not so sure…. 20 tickets in one book?